If you've been admiring the striped socks that I've been writing about recently, you might be happy to learn that the pattern snuck out last night. They're called Marmalade and they are written to fit the large, male feet in your life. Bright, fun, interesting -- but still masculine -- socks for men. Yes. Grab them for your own by clicking that wee button up there, or get them here on Ravelry, or over here in my Etsy shop. 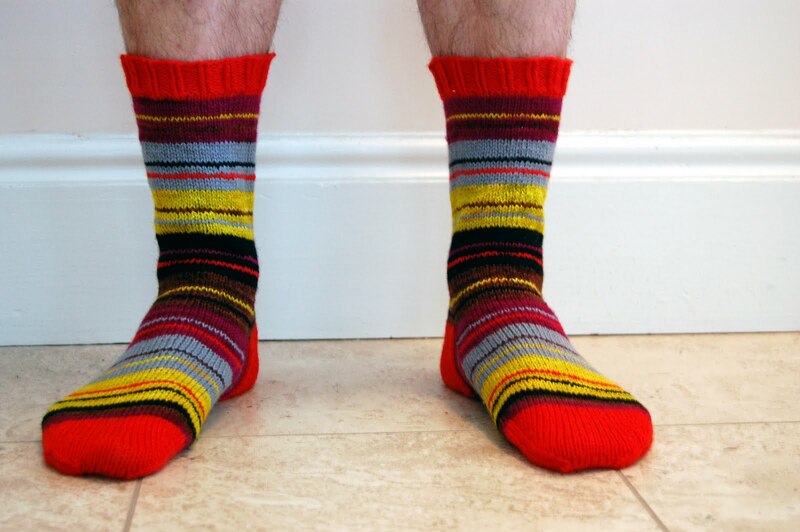 As written, the pattern gives directions to produce socks to fit any foot that is 9-10" in circumference (or a US men's' size 12 foot,) but by adjusting the gauge they can be easily sized down to fit an foot you like. As an added bonus, these socks provide you with the perfect opportunity to out those odd bits of sock yarn you've been harbouring to wearable (and fashionable) use. You only need about 25g (or roughly 110 yards) of the Main Colour yarn (in my case, Red,) to turn out an entire pair of seemingly randomly-striped (but colour wise, properly anchored,) socks. This is odd-ball-of-sock-yarn heaven, folks! If you want to talk exact yardage, please drop me a line. I'm off to get my work in order so I can show you What's Next. They are awesome! I just can't justify making men's socks though. February 9, 2011 at 10:46 a.m.
Adore! I just dyed some yarn called Marmalade...now you've got me thinking about striping it all up. February 9, 2011 at 12:56 p.m. I just read that The Loopy Ewe is working on selling kits to go with your mitten patterns... is it true? If so, I'm SO excited! February 9, 2011 at 8:08 p.m.
17th stitch -- It is! I'm excited about it too! February 9, 2011 at 8:10 p.m.
February 10, 2011 at 12:46 a.m.
Would you be willing to do a trunk show for the Knitting Guild of Windsor/Essex County? We (currently less than a dozen knitters) meet at Knit One Sew Too on the second Thursday of each month at 7 p.m.
February 10, 2011 at 12:05 p.m.